I profess to live in poverty, chastity and obedience for the period of one year. Like the process of dating, engagement and marriage, the process of becoming a fully-professed member of a religious order takes on many stages. Last August, I professed for the first time my vow to live in poverty, chastity, and obedience in the way of St. Francis of Assisi. In a way, these vows were a test: I was testing the life to see if it was truly where I was called. And wouldn’t you know it? Time’s up on that first year. 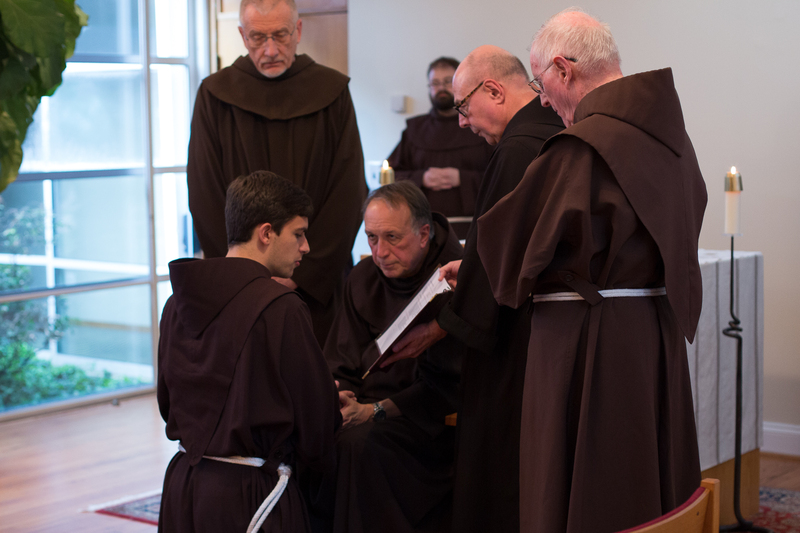 In the Church’s great wisdom, however, the time has not come for me to make my lifetime commitment: for the next three years, all I have to do is profess vows for a period of one year as I continue to discern my place in the Order of Friars Minor. To the Praise and Glory of the Most Holy Trinity, I, Brother Casey Cole, since the Lord inspired me to follow more closely the Gospel and the footprints of Our Lord Jesus Christ, before the Brothers here present and in your hands, Brother Dominic, with firm faith and will, vow to God, the Holy and Almighty Father, to live for the period of one year in obedience, without anything of my own and in chastity, and, at the same time, I profess the life and Rule of the Friars Minor, confirmed by Pope Honorius III, and promise to observe it faithfully in accordance with the Constitutions of the Order of Friars Minor. Therefore, I give myself to this fraternity with all my heart so that, through the efficacious action of the Holy Spirit, guided by the example of Mary Immaculate, through the intercession of our Father St. Francis and of all the Saints and supported by your fraternal help, I can constantly strive for perfect charity in the service of God, of the Church and of mankind. It was a quick and simply ceremony within the context of Evening Prayer, but was the result of careful discernment and conscious action. 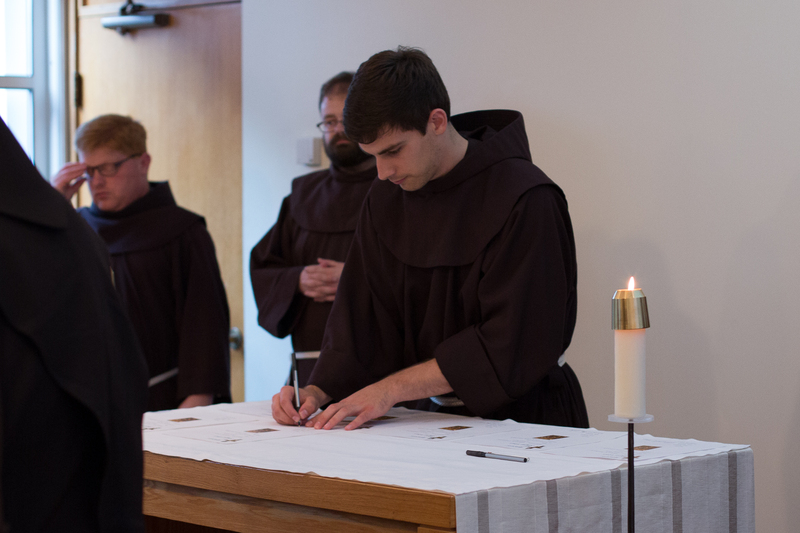 Each year we must step back, look at our lives, and ask ourselves with great conviction: “Where has God called me to be?” For the next year, I believe that God is calling me to continue in the way of St. Francis in the Order of Friars Minor, taking one step closer to formally committing myself to God and his Church. It has not been a full year since your first vows!!! Vocations to religious life are a blessing and a gift from God. We bless our brother in Christ! Congratulations Bro! May God keep blessing your vocation and ministry. Greetings Brother Casey! I live in Marcus Hook Pa, just a few miles from the Renewal Center on Silverside Road where I sometimes attend mass or go to stations during Lent. Father Francis helped out at my parish the Immaculate Conception of Lourdes in as he calls it “The Hook”. The Archdiocese of Philly closed us up last year so I joined Saint Helena’s down on Philadelphia Pike but I really enjoy going to the Friary for mass and other events. You got your start at good place with really good people in Wilmington. I have been reading your blog for a couple months now, I found it by accident. The story of the Poor Clares was interesting to me, I did not know we had a monastery so close. Okay I’ve gone on enough, just wanted to let you know that I enjoy your blog, the last one on begging really hit home! God Bless You & my prayers are with you. Thank you for sharing that with us Casey. That was simply said. We will continue to pray for you. May God continue to bless you and show you the way. Thank you all! Here’s to another great year in vows!